The Ice-Bag Wine Chiller is a new product that has just hit the North American Market. It is a clear plastic wine tote and chiller that is reusable. It is completely water tight and portable. With it's sleek design and trend-setting appeal the Ice Bag Wine Chiller is an alternative to the ice bucket. And talking about trend setting, this Ice-Bag Wine Cooler has been used at venues such as the Ascot Racetrack, to high profile concerts (Madonna, Elton John, George Michael). 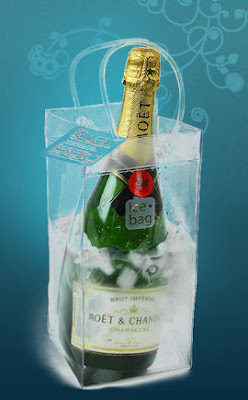 How fun to display your wine or champagne in this Ice Bag Wine Chiller. I think that it would be great to use for weddings, special events, or your next party. It is even customizable with your own logo. For the coolest drinks in town, re-usable Ice-Bag Wine Chiller. My friend Joyce is distributing these. Please contact Joyce for ordering information for Canada, South America, and the Americas here. What a great gift idea! Patrica, I would love to POST this on my blog. Let me know if this is ok? Just what we need during this challenging economy. We all need to drink a little more. A lovely idea to bring to a picnic! tres chic , no ? Saw a reference to your post on my wife's blog Champagne Wednesdays; thanks for the great gift idea, the world really does need more Champagne and this would make it much easier to bring/share. What a great idea... the ice-bag wine chiller. From looking at the photo, it appears it comes in different colors as well. How cool that you gave a plug for your friend joyce. New, very nice and great product. I have one and love it! Can't wait until the sun comes out and I can start using it again! Interesting concept. I have a feeling this will be big. I wonder if they have a beer can alternative for men. I need this, this weekend! Recently came accross your blog and have been reading along. I thought I would leave my first comment. I dont know what to say except that I have enjoyed reading. Nice blog. I will keep visiting this blog very often. I read about your concept. I must say it is a wonderful achievement in the drinks market. It will shake the world. I already made an order and all went good.Hope it's useful! What are you going to do with your week?